Solar power is picking up steam in the southeastern U.S., and the development is not all being driven by large utility companies. 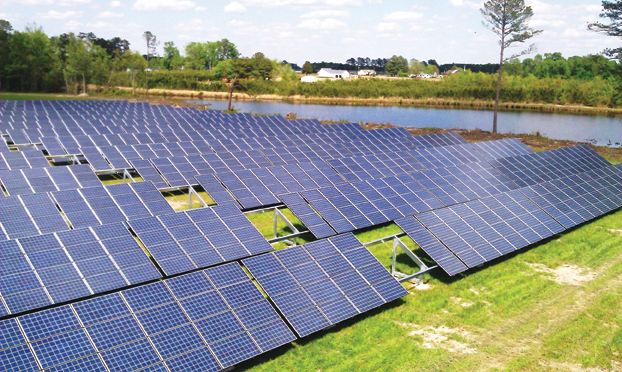 North Carolina renewable energy firm O2energies has a unique approach to solar projects, utilizing unused farm land, and it recently completed a 1.5 MW project in the eastern part of the state. The land on the Lewis Family farm is used for growing grapes. But a portion of the farm was severed by Interstate 95, leaving a sliver of land that produced little income. That sliver of land is now producing solar power. Although it does not automatically come to mind as being a hotbed for renewable energy, the U.S. southeast has good potential for solar power and is certainly of interest to the industry. Witness the fact that North America's largest solar power show, Solar Power International, is being held this September in Florida. The southeast states vary in terms of the type of renewable energy they employ and how many projects they have. North Carolina is also now home to the country's largest utility, Duke Energy, which has built a number of solar and wind power projects and recently completed a $32 billion merger with Progress Energy. The move creates the largest electric utility in the United States, with 7.1 million customers in six states in the Southeast and Midwest. The company has its headquarters in Charlotte, North Carolina. While North Carolina and the region may be home to energy titans such as Duke Power and Florida Power & Light that are involved in large scale solar power projects, a number of smaller firms are moving renewable energy ahead. Earlier this year, wine bottles were popped at the opening ceremonies for the 1.5 MW Sandy Cross solar farm in eastern North Carolina. The wine bottles were an appropriate touch since the 8-acre solar project is located on a previously unused portion of the Lewis Family Farm, which produces organically-grownmuscadine grapes, used in wine making. 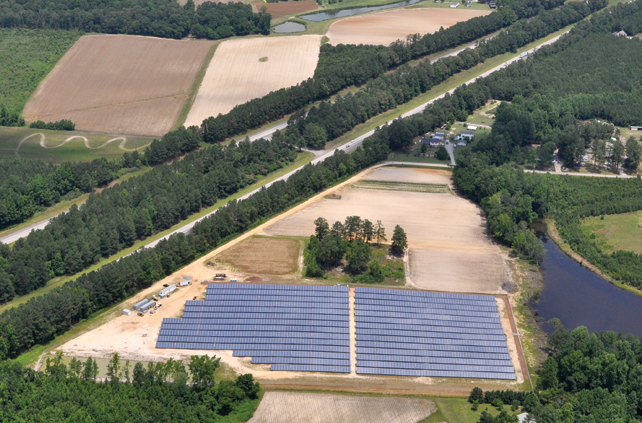 The Sandy Cross solar farm is the most recent project completed by O2energies, a mid-sized Charlotte-based solar development firm that has built a reputation for combining sustainable agriculture and sustainable energy production on farms in the southeastern U.S. 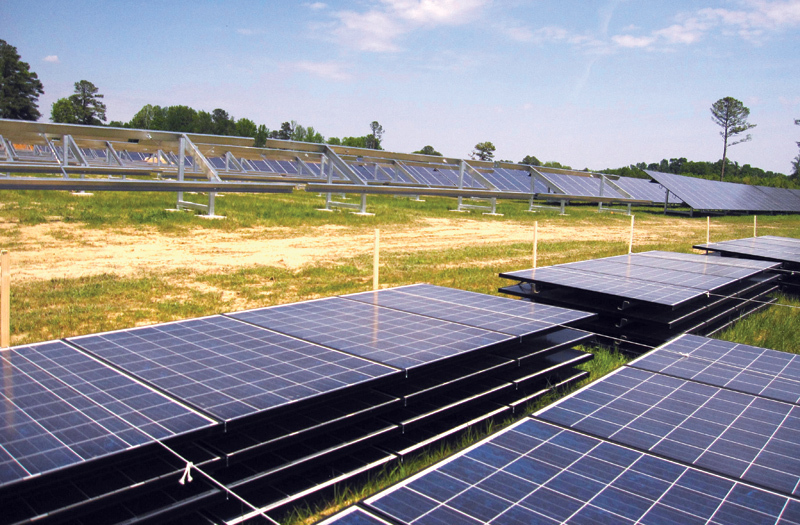 The company owns and operates several solar farms in North Carolina. The company's president, Joel Olsen, notes that agriculture and energy production can complement each other. Solar farms have a low profile, are noiseless, produce no pollution, and consume no water. Olsen points out an interesting fact: solar farms can often be easily placed on farm land that is unsuitable for crops—that same land can be ideal for producing energy. Olsen explained that the Sandy Cross project started with discussions with Old North State Winery and Brewery, which uses the grapes from the Lewis Family Farm's vineyard. "There was land on the vineyard that wasn't suitable for growing grapes, and there was interest in possibly leasing out some portion of the farm to generate renewable energy." At the same time, North Carolina-based Progress Energy (now part of Duke Energy) put out a Request for Proposals and Renewable Energy Credits for solar power. Among the 80 workers who built the project, half were from Nash County, where the Sandy Cross project is located, and most others were from neighboring counties. The employment is all welcome, as the county has a higher than national average unemployment rate, at 12 percent. "We responded to the RFP using the Sandy Cross vineyard as the location, and our proposal was selected," said Olsen. "Shortly after, we began working with Nash County on a new ordinance that would allow solar farms to be built in the county. We spent a lot of time working with the county planning department to make sure the permitting and zoning would be possible." While the Sandy Cross project is in eastern North Carolina, the state as a whole has generally good solar exposure, says Olsen. "We have about the same solar irradiance as you see in Florida, and we have slightly cooler temperatures, so solar farms produce quite well in North Carolina. In the mountains, there is some cloud cover, which reduces the sun somewhat, but overall, it's pretty uniform throughout the state." And there is demand for power. While there has been a plateau in demand in the last couple of years due to the economic downturn, long-term demand for power is expected to grow in North Carolina and the surrounding region. Studies say that regional electricity capacity will need to increase by nearly 50 GW by 2030. More of that power is expected to come from renewables, says Olsen. "In the region, we're heavily reliant on older coal plants, with an average age of 50 years or more. We believe that in short order, there will be a retirement of those coal plants and a transition to newer sources of energy, and solar should be a large part of that." Compared to the national average, the Southeast uses a slightly higher percentage of coal and nuclear energy and a lower percentage of natural gas to produce electricity. "We have very high demand for power during daylight hours because of the use of air conditioners, and that would fit well with solar power," Olsen added. There are some hurdles to the widespread employment of solar. Unlike other states such as New Jersey and California, the southern states have had little in the way of incentives for the development of solar power. As much as possible, O2energies used North Carolina suppliers for much of the project's development. Daetwyler Clean Energy, of Huntersville, North Carolina, supplied the mounting and racking for the fixed-tilt array. "If you look at the southeast in general, it has tended to be quite slow in the adoption of renewable energy standards," Olsen says. "But North Carolina and some cities in the southeast have taken a lead." He noted that the North Carolina Sustainable Energy Association has been instrumental in moving renewable energy forward, working out a transparent interconnection standard with the major utilities, and championing a state bill encouraging development of renewable energy. And things are changing, although slowly, in the other states. "Outside of North Carolina, we also see cities, such as San Antonio, Texas, and Gainesville, Florida, which have adopted renewable energy related policies of their own to promote local industry. And certainly in the Tennessee Valley Authority footprint, there has been an expanded opportunity in renewables compared to the rest of the southeast." Georgia and Florida, he noted, have instituted some renewable energy incentives with capped funding. "We're seeing the southeast starting to move down the path of a more sustainable energy future." Olsen's company, O2energies, would like to be part of that future. They focus on a somewhat unique market niche: sites that can't be used for other purposes. Their Avery solar project, for example, was built on six acres of a Christmas tree farm. "The site wasn't suitable for growing trees—the frost near the trout stream on the property would kill the trees—so we built a 1 MW project on the six acres." Another project, the Mayberry Solar Farm, was built on six acres of land around the wastewater treatment plant of the City of Mount Airy, North Carolina. "The land around the treatment plant had been kind of a smell buffer area and was expensive for the city to maintain. 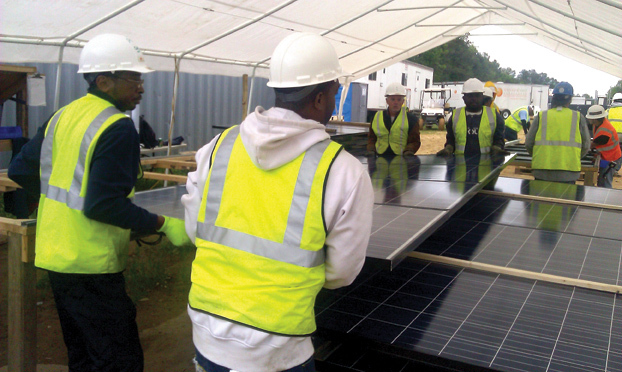 With the solar project, the city benefited by having workers involved in the project, getting lease income, and no longer having the expense of maintaining that property." The land for the Sandy Cross solar project has been in the Lewis Family for seven generations. The current generation started using it for growing muscadine grapes. "But a portion of the farm was severed by Interstate 95," Olsen explained. "Just on the other side of the interstate was this sliver of land, it had two graveyards on it, and it produced little income." As noted, they worked closely with local officials on the project. "From day one, we worked with the county government and local elected officials, the community college, local stakeholders, and neighbors of the project to inform them and give them an opportunity to work on the project." With all this in place, the project was completed within a two-month period. For Sandy Cross, O2energies used 6,000 Renewable Energy Corporation (REC) modules, which are made with U.S.-produced silicon. As much as possible, they used North Carolina suppliers and local manpower for much of the project's development. Southern Energy Management PowerSecure, of Morrisville, North Carolina, engineered and constructed the farm. Daetwyler Clean Energy, of Huntersville, North Carolina, supplied the mounting and racking for the fixed-tilt array. "The racking system from Daetwyler was new," says Olsen. "It met the wind tolerance for the Sandy Cross site. Being close to the coast, we have a higher wind loading. It is a 25-degree fixed tilt structure, and it was also one of the first UL-certified systems. The system also features a new Anchor system that minimizes ground penetration." Because the region is prone to extreme weather, solar racking systems in most of North Carolina must be built to withstand 90 MPH winds. Being closer to the coast, the Daetwyler systems on Sandy Cross have to withstand 100 MPH winds. "This area is also prone to thunderstorms, so it's important that the system be well grounded, which is part of the racking system." Sourcing materials locally is important to O2energies, says Olsen. "We think that involving the manufacturers in the project is important to ensure we have quality, and so they have ownership in ensuring the project is a success. With suppliers nearby, they can regularly see the progress of the project and ensure its performance." Olsen reports there were no major construction issues with the project; there were no rocks or other obstructions that might have impeded the installation of the racking systems. "We were also very lucky in that we had no severe weather that could have caused delays." Among the 80 workers who built the project, half were from the county, and most others were from neighboring counties. The employment is all welcome, as Nash County has a higher than national average unemployment rate, at 12 percent. "We had over 40 workers who were trained to work on the Sandy Cross project," says Olsen. "While the construction period was short, many of these workers will also be working on O2energies' next project, so they can start to form a new career." He added that industry accreditation for renewable industry workers is based on the North American Board of Certified Energy Practitioners (NABCEP) standard. Basic level certification involves 40 hours of course work and a test. A number of people who worked on Sandy Cross will be seeking that certification—and perhaps more. "To get the Installer level NABCEP certification, you have to have work experience from at least two separate projects, and we feel Sandy Cross has given 40 people the opportunity to get their first project under their belt," says Olsen. The 1.5 MW of power produced at Sandy Cross goes into the Progress Energy grid, and much of it is used locally, including by the Lewis Farm and a local airport. Southwest, Olsen feels that mid-size and smaller projects form an important part of the renewable energy mix. O2energies has three projects in the 1 to 2 MW range and four projects in the 4 to 5 MW range. "Projects smaller than 20 MW are usually easier to permit and easier to build—generally there is less opposition and there are more places where you can actually build them," says Olsen. "We're focusing right now on the 1 to 10 MW range. Out west, they have different conditions, and they are looking for larger projects. We feel the number and frequency of projects we can develop in this size range is right for our company." U.S. "It doesn't matter if the farm is big or small. The question is, ‘is there a piece of the farm that is not currently generating revenue for the farmer that the owner wants to sell or lease for use as a solar farm?' We also work to integrate sustainable farming on our solar farms." solar farms have pasture animals, such as sheep, maintaining the ground under the solar power equipment. Ray Family Farms is a leader in sustainable agriculture and energy conservation. Recently, Chad and Jodi Ray were welcomed as "Champions of Change" at the White House in Washington, D.C. The Rays raise horses, cattle, hogs, poultry, and vegetables, and they produce and sell organically grown beef, pork, chicken, duck, and eggs. "We see locating on unused portions of farms allowing dual use, that solar and agriculture can go hand-in-hand," says Olsen. Olsen has some thoughts on what could move solar power further ahead in the region. "What we'd like to see most going forward is a sustainable energy policy that allows us to transition from our older power plants to a mix of power that includes solar as a strong component. "We don't want a flash in the pan incentive, but we do want a long-term incentive that allows a supply chain and industry to be set up. That's really our focus rather than maximizing incentives for a year or two." That long-term incentive can come at different government levels, whether federal, state, or local. "We've already seen moves by cities and states to establish themselves as leaders in this new energy economy. I think we will continue to see that. States can often move faster than the federal government in doing this, and cities can often move faster than states." Olsen added that O2energies has seen a good level of cooperation and interest from the utilities industry. "They've been helpful, open, and good to deal with. I think that gives us hope that the utility industry in general is starting to embrace solar power."